Tuesday evening, during the Costa Mesa City Council study session - you can watch the video HERE - several council members expressed the view that the Community Development Block Grant Funds (CDBG) traditionally earmarked for specific charities in our city should be re-directed to infrastructure improvements instead. During the discussion Mayor Pro Tem Steve Mensinger offered his views. Here are a few verbatim snips of his comments, beginning at the 01:11:17 mark on the video counter. (just drag the scroll bar across to that point). These represent clips from his broader comments that ran just over 4 minutes. "I'm not suggesting that we cut these programs. I'm suggesting that we move them to a category and move them to the General Fund and see if they really matter." "At the end of the day, I belong to nine different organizations - all charities or non-profits. Those charities receive no government monies. They raise money. In fact, they still exist without CDBG funds." "Every one of the groups I belong to does not receive money from the government. They raise the money, do the right thing." "If they need to be funded I think they can be funded through the General Fund. I don't want to fund these social programs through our CDBG funds." His suggestion that the programs not be placed under the scrutiny of the rules for the CDBG funding process - that they would, or would not, arbitrarily be considered for funding out of the General Fund, implies to me that he and his fellow majority members on the council have little interest in funding them at all. And, in case you've forgotten, Mensinger's statements above about the groups to which he belongs NOT receiving government money are fallacious. He's got a very selective memory. In recent months Pop Warner Football - a group with whom Mensinger has a long, long affiliation - was given $10,000. 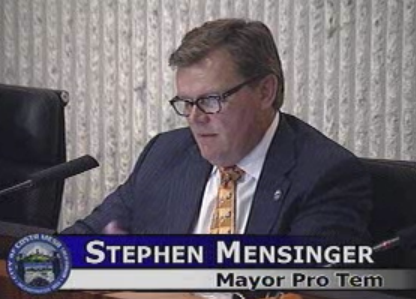 Costa Mesa United - a group that includes Mensinger on their board - received $100,000 from the government - the City of Costa Mesa. Costa Mesa United also apparently received $3,500 from the City for a table at the recent fund raiser golf tournament. The City, using government funds, also apparently ponied up for a table at the Estancia High School/TeWinkle Schools foundation dinner. I am NOT saying those organizations are not worthy of financial help from the City, just that Mensinger's convenient brain fade is, to use one of his favorite words, disingenuous, to say the very least. It was very clear to all observing the study session Tuesday that the majority on the council plans to discontinue providing CDBG funding for most of the organizations that have applied and have been screened and ranked by the ad hoc committee tasked with doing so. Instead, it's very likely that those dollars will be directed to fill potholes and repair sidewalks in areas of the city that meet the CDBG requirements - mainly on the Westside, in a couple small areas on the Eastside and near the Mesa North community. Quite honestly, after listening to their comments Tuesday night, it seems very unlikely that few, if any, of those charitable organizations will receive ANY funds from the City this year. And, if they do, it will be under a much more capricious method of selection - pet projects will get the bucks and other worthy and needy organizations will be left out. It is unlikely that the organizations in question will fold if not given the stipend from the CDBG funding. However, as Councilmember Wendy Leece pointed out, the loss of those funds will significantly diminish their ability to deliver services to their clients. Two food programs for Senior Citizens were mentioned specifically. The council will make its decision at a future council meeting as part of the broader budget discussions. I imagine they might like to hear from you on this subject if you have an opinion one way or the other. Please feel free to call them, write them a letter or send them an email at the addresses listed on the City web site. Man crush in full display. Even though Genis was saying the same thing. Leece is all alone in her thinking but that does not get brought up here. Speaking of bromances, Jimmy Fitzy must have done ok in his meeting or we would have heard asimilar report taking all comments out of context. Already told 'em how I feel. I want that money to fill potholes. Developers need good infrastructure to support their projects. People needs are secondary. Any questions? The point, CM United member, is that Steve LIED, not What CM United did or didn't do with the money. If the money went to infrastructure does it mean it's OK for a councilmemeber to LIE to us?